SCENARIO: we’ve all just watched Virginia take home the title, beating Kansas 61-57. That capped off a Final Four weekend that featured three #1 seeds and a #2, with any one of Virginia, Kansas, Michigan State or Auburn being a potential worthy champion. 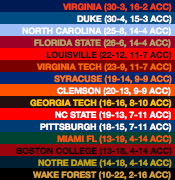 Virginia won the ACC with just 2 losses, coming against Duke and Virginia Tech (the latter in a shocking lopsided defeat, with the Hoos incredibly only scoring 33). Florida State rebounds nicely from their late struggles to tie for third with North Carolina. Duke and Virginia, back and forth throughout the season, enter the ACC tournament as the consensus two best teams in America, and the tournament final is billed as a possible, if not likely, championship game. Duke prevails, and despite being the #2 seed in the ACC, they’re #1 overall in the NCAA tournament. Virginia is the second #1 seed. Kansas’ streak of Big XII championships continues to a 15th consecutive in this sim, as it has in the last couple of Season Sims. It was a typical Kansas season in a lot of ways – against the other six teams from the conference that made the NCAA tournament, they went 10-2, the only losses being to Oklahoma near the end of the season, and the Iowa State game that has already happened IRL. That gave them leeway for inexplicable losses at home to both Oklahoma State and West Virginia. Despite an early exit from the Big XII tourney, Kansas at 25-7 is good enough to snag the final #1 seed in the tournament. Elsewhere in the Big XII, Kansas State is nearly a bid thief after upsetting Kansas and Oklahoma in the conference tournament, but they fall in the final. Next is the Big Ten, where Michigan State recovers from losing 4 out of 5 games in late January & early February to enter the NCAA tournament on a 12-game win streak. 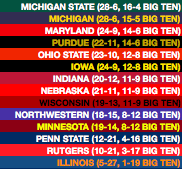 That includes a season-ending matchup with Michigan, which when both teams enter 15-4 in conference play is the decider of which team will win the Big Ten. It’s the Spartans that do, and they get their third victory of the season over the Wolverines the very next week in the Big Ten tournament final. Ranked #3 in the AP poll the week of the tournament, MSU picks up the #1 seed in the Midwest Region, beating out Kansas for the opportunity to play in Kansas City. Michigan is ranked #8 and gets a 2 seed. As mentioned above, the final Final Four team is Auburn, who always seem to fare well in the NCAA tournament in these exercises. 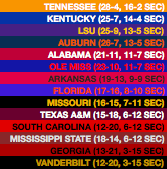 In the regular season, it’s Tennessee who walks out with the SEC championship, two games ahead of Kentucky and three ahead of both Auburn and LSU. The Big East is a bit of a runaway this season, with two teams pulling way ahead of the pack, and maybe not the two you’d expect. Most would expect Marquette, and they finish with a 13-5 conference record, enough to win the league on the final day when Butler (12-6) loses unexpectedly to Providence. No one else finishes above .500 in conference play, including the defending champs Villanova, who actually finish eighth with an 8-10 record (though that’s a mere one game plus tiebreakers behind the #3 team, Seton Hall). Nova gets into the tournament anyway as one of the last four in, as does that #3 team Seton Hall. The Pac-12 nearly hits its nightmare scenario of not getting a single at-large bid, and it looks like that might happen when #1 seed and consensus tournament pick Washington takes the tournament crown. But the committee smiles on the Pac-12, sorta, as both Arizona and Arizona State earn trips to Dayton as the other two members of the First Four, creating two Pac-12 vs. Big East showdowns in the play-in games. Oregon State, meanwhile, has maybe a legitimate gripe at being left out, but their 22-9 record didn’t really have any gems in it. It’s three as well for the American. Houston, the team that’s been romping through the AAC in these Season Sims, takes third as Temple wins this one. The Cougars still wind up as the AAC’s highest seed, though, as they earn a #3 with their 29-5 record. The only other at large bid falls to Davidson, as their 25-8 record is deemed to be worthy despite losing the A-10 tournament championship to Saint Louis. Nevada, Buffalo and Gonzaga all win their conference tournaments this time, so no additional bid thievery is at hand. An interesting tournament all considered, with three 12-over-5 upsets, another fun run from Loyola (although this year’s Loyola team is not nearly what last year’s was), and we nearly see all four #1 seeds make it to the Final Four for just the 2nd time ever. Auburn’s 92-81 win over Duke in the Elite Eight is the only thing stopping that. Alright folks, thanks for reading along and I’ll see you with the next one soon! I’ll have another BracketBot update on Friday to get us looking into the weekend. See you soon!